First things first, I should apologize for not writing a review for a long time. The simple explanation consists of two things. First, I've been busy with life changing events. Second, I haven't been buying as many new games but instead been playing Pokemon Shuffle with the little spare time I had. However, I did pick up Twilight Princess for the Wii U for a few reasons. First, I wanted the soundtrack that came with it. Second, I cannot play my Gamecube version for a while as I do not have access to a Wii or Gamecube to play it on. Third, I wanted to check out the Wolf Link Amiibo and I hope that it has some neat feature in the new Zelda game. So how does the game hold up as I went through effectively my third playthrough? Pretty good and it gives me some hope for how the new game will turn out. Of course, I should clarify but what I meant by the word "hope". There are some good features that I want them to carry over and there are features I want them to make/improve. All of these have to do with the gamepad implementation. 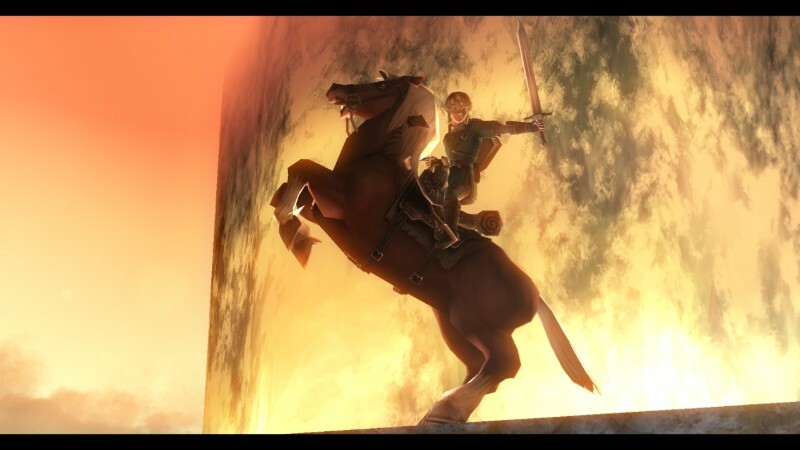 Twilight Princess used the gamepad to an okay level. You can play the full game using the gamepad only, but I found that out by accident rather than being told how to do so. For those who want to know, pause the game with the + button and then press the - button to switch displays. As a warning though, the resolution takes a hit. It still looks nice, but not as nice as on a 32-inch 1080p HDTV. To make up for that, Nintendo included a feature that's nice for "need to be quiet" time: Audio Source Swap. If you plug in headphones into the gamepad, the game audio will automatically stop playing on the TV, switching completely to the headphones. It sounds so trivial, but I utilized that feature quite a bit during the 30 hours I played. Now the gamepad can be used for both items and map display and you can use either in real time. I found that neat for the times when I wanted to swap items when waiting to reach a destination. A good example is when you are sinking in the water and want to pull out the clawshot or water bombs. It may not save a lot of time, but it's a lot of the little moments like that where you can determine if a feature is good or not. If you are in big trouble, then you can always pause the game and change your items that way. It's good, but it could be better. 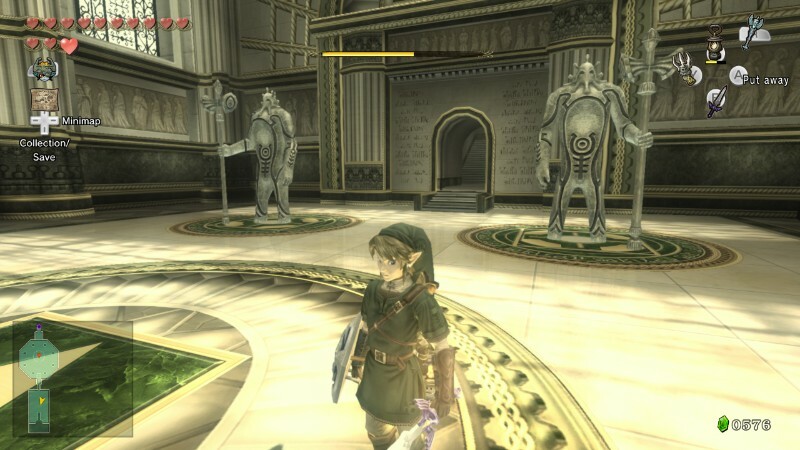 Twilight Princess is an interesting Zelda game in that it does try to utilize old items later on, but those occasions are sometimes only for one-time use. As a result, I find it annoying to assign one item to button and then change it back to something I'll actually need. For instance, the bombs are sometimes used everywhere, but not often enough to keep a button assign to them. There are two things I would like done here. One is to follow the example of Ocarina of Time 3D in which there were 2 touch buttons that you could assign items to. That way, you just tapped that button and the item would be used. The second option, which I think would be better, is a double-tap activation for the item on the touchscreen. It's perfect for the often one-time need, and by making it a double-tap, the chances of wasting precious resources becomes smaller. I know that Nintendo can do that, because they implemented it to do one awesome feature: the change between human and wolf-Link! It's perhaps one of the best additions to the game as it makes things so much smoother than having to talk to Midna to transform every single time, only to find out that you can't do it. Once you gain the ability to transform on-demand, that icon is fantastic. No longer are you bound to fighting either as a wolf or as swordsman because it's too inconvenient to switch. Two thumbs up for this feature! As a side note, everything that is selectable in the menu screens works with the touchscreen as well. I could select portals to warp to without talking to Midna, change my equipment, save my game, etc. So bonus points for that as well, Nintendo and Tantalus. There is a another worry aspect and that's the hub on screen. You can have the map displayed on the gamepad, but you are still forced to have the hub on your TV. I looked at the settings, but I couldn't turn it off. Maybe I do want to keep them on screen, but sometimes it's in the way, especially since I did actually look at the gamepad map most of the time. It's a handy tool though I'm not sure if the tab design for switching between map and items was best practice. I might have liked a 3rd option that had the mini-map with some items to pull from. One improvement I would like added here would be to be able to write notes like in Phantom Hourglass. The reason for this is because I found some treasure chests, but was unable to access them until I found an item. I would have liked to make a note for myself, which I could do with the 3DS built-in game notes, but the Wii U doesn't have such a function. To be fair, you can share pictures like this on Miiverse with your notes. Back to the improvements, I'll claim that Amiibo was implemented fairly well. Since Link is one of the most popular Amiibos, it's generally safe that the player has Link or maybe Toon Link. Using the Link (or Toon Link) amiibo restocks arrows, which is a useful function without being game-breaking. The only caveat is that you cannot do it more than once a day (I don't know how it works if you have multiple Link Amiibos). Now if you bought the edition with the Wolf-Link Amiibo (a.k.a. the Midna Amiibo), you can play a special gauntlet of enemies as Wolf-Link. What I've learned form doing that is that the wolf form is more powerful than the Master Sword and sometimes easier to defeat some enemies. Last improvement to note is the option to use motion controls. You may not want them, but I found to be using it more often the the control stick. Why? Because I could move the camera at just the right speed and precision for my target. It is on by default, but turning it off is as simple as going to Collection screen (Down on the D-Pad) and then Settings (lower-right corner). However, I do suggest to try using them for the whole game. The same rule applies here as with every Nintendo motion controlled game: the game initializes its tracking based off your controller's location at the instant you regain control. So if you use the clawshot to reach a location, it will re-initiliaze after you reach that location so you need to make sure that your controller isn't at a funny angle. It was like this for Wii Sports Resort, Skyward Sword, and Splatoon. I think most of those who hate motion controls really just don't pick up that this is how it works. 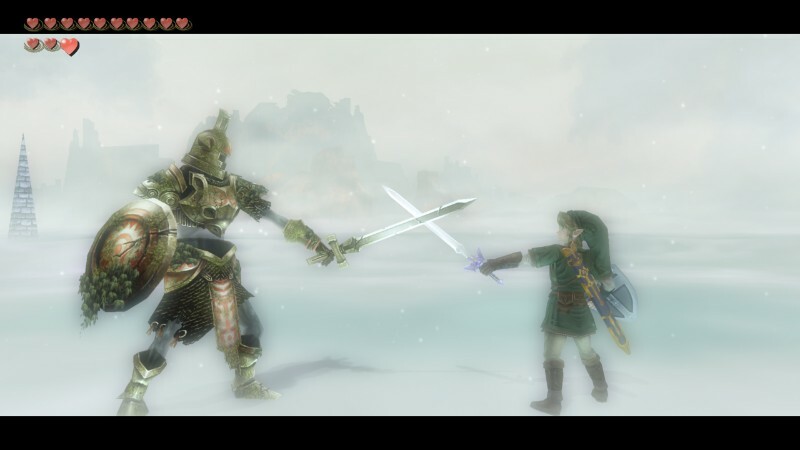 Now, if you already know you don't like Twilight Princess, this port probably won't change your mind. The story and pacing is still the same. While some of the core gameplay has been improved thanks to the gamepad and motion controls, you still have to deal with the mandatory mini-games and side-quests. On the other hand, if your complaint was the graphics, they look nice here. At least as nice as I recall them back in 2006. If you were wondering about picking this up, then hopefully this analysis proved to be helpful. Interesting. I'd like to hear more about the amiibo wolf link functionality since i didnt open my amiibo (and plan on selling it since i dont like the game very much).